For years, Colombia was synonymous with great coffee. But in 2013, coffee is at a crossroads. I’m about to drink from a cup of black coffee made with beans grown at 5,000 feet above sea level in Huila, a province in southwestern Colombia. Huila is not exactly a tourist hotspot. Much of it is still mountainous backcountry where leftist guerrillas still roam – the Colombian army and FARC forces regularly clash in the steep passes and heavy jungle. Back in BogotÁ¡, however, coffee snobbery is on full display. Duque prepares the beans with triple-filtered water through an Aeropress, a method akin to the French press that uses a disposable paper filter. The coffee is exceptional. For many years, coffee was the symbol of Colombia abroad – well, besides another export beginning with a “c.” Long before Blue Bottle and Ritual and Stumptown and the current class of high-quality, small-batch coffees, often sold with their far-flung country-of-origin prominently displayed, there were Colombia’s gourmet beans, something the National Federation of Coffee Growers of Colombia has been bragging about since its formation in 1927. 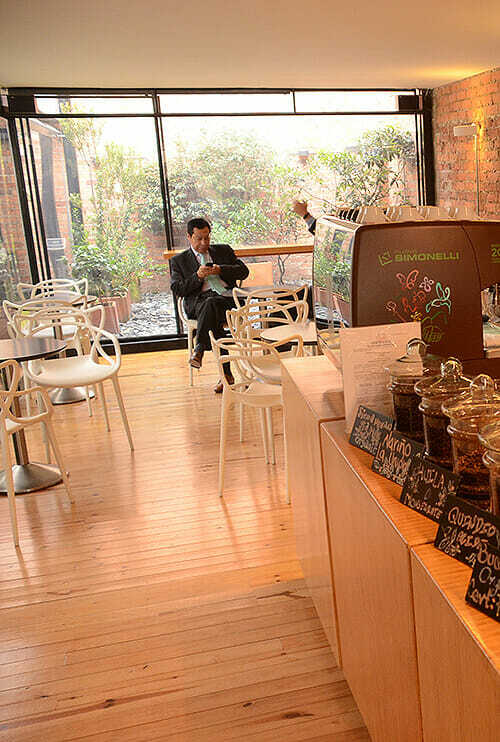 And still, the country’s coffee can be found at high-end coffee shops from Buenos Aires to Portland, London to Tokyo. 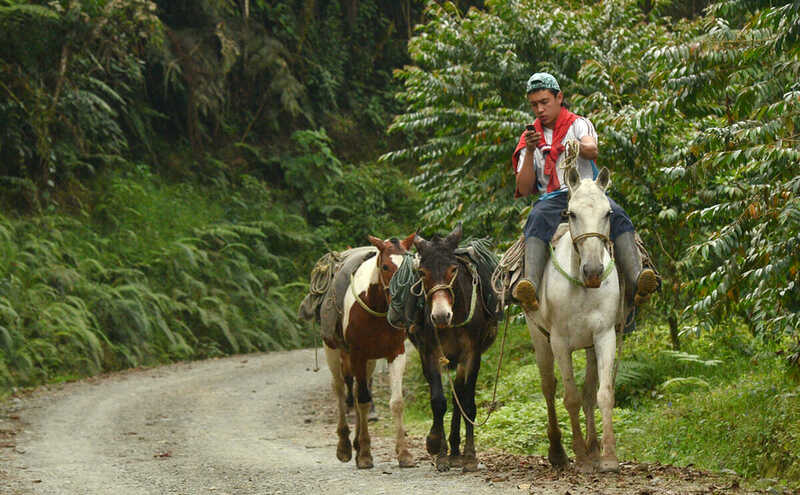 But in 2013, Colombian coffee is at a crossroads. Preparing coffee with an Aeropress at E&D Cafe. Checking a smartphone while sipping coffee at E&D Cafe. “There are two lines of coffee: quality and volume. Deciding where Colombia’s future lies is key,” explains Ivanov Castellanos, owner of a family-run coffee farm outside Manizales, a city in the heart of Colombia’s coffee-growing region. He points to Brazil, which has ramped up coffee production to meet global demand. The problem, says Castellanos, is that this involves clear-cutting rainforest and planting inferior beans. Brazil produces around 40 percent of the world’s coffee – much of it bulk-rate beans used for blending. Colombia’s contribution hovers near just six percent. Castellanos wants his product to stand out from the likes of mass-produced Brazilian or Vietnamese coffee. To do that, he’s found clients in the United States he can sell his beans to directly. I climbed with his father Efrain through the steep groves of stout coffee trees up to the highest point of the ten hectares they call Altos de Tio Conejo (“The Hills of Uncle Rabbit” in English), named for the farm’s pet rabbit. Looking down on the rows of coffee checkered with leafy banana trees, Efrain tells me that it’s Colombia’s rich volcanic soil and perfect combination of sun and rain that allows their farm to harvest beans continually throughout the year. The question is: who’s buying? Coffee came with the Spanish missionaries in the 1720s, and the country began commercial exports thanks to newly built railroads in 1885. By the time Juan Valdez, the mustachioed fictional mascot of the National Federation of Coffee Growers of Colombia, hit American airwaves in 1958, Colombian coffee had become synonymous with quality coffee. But the market of 1958 was relatively simple compared to the fragmented market of today. 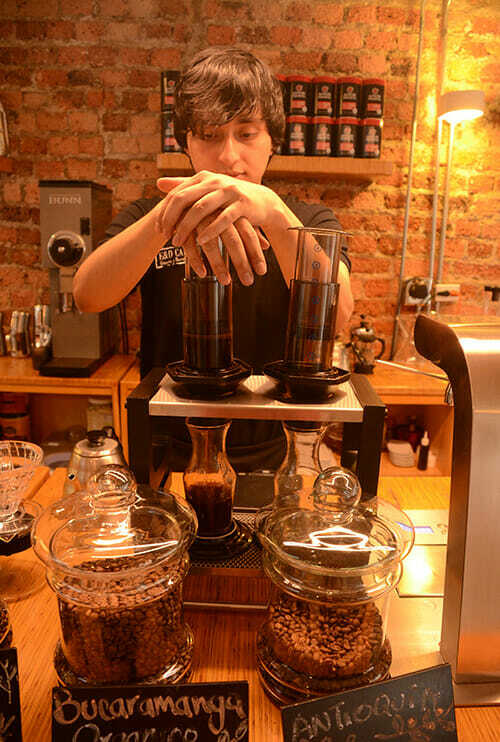 Perhaps most of all, Colombia is feeling pressure from newer beans from Sumatra or Tanzania or Panama or El Salvador, currently more en vogue among third-wave coffee connoisseurs at high-profile coffeehouses like Chicago’s Intelligentsia or Portland’s Stumptown. “For a time, specialty coffee buyers just weren’t that interested in Colombian coffee,” admits Geoff Watts, vice president of Intelligentsia. Coffee beans at Altos del Tio Conejo. Enter the Federation. Founded in 1927 and representing one-third of Colombia’s coffee growers, the government-subsidized group works with scientists to spread best practices and research across a dizzying number of smallholder coffee growers. “Colombia has 560,000 coffee producers with an average coffee farm size of 1.6 hectares,” points out Samper. “Our challenge is to establish quality control across so many producers.” To that end, the Federation analyzes 35,000 samples of coffee a year domestically and worldwide to ensure that the Colombian coffee being produced will pass muster with even the sniffiest of coffee snobs. Those outside of the Federation have to seek other avenues for selling their beans. Some farmers who have invested heavily in boosting the quality of their coffee would rather market it themselves than have the Federation throw it in with lots of inferior beans. Many have found other middlemen interested in buying their unroasted green beans, which is how most coffee growers sell their product. Starbucks, for example, buys from coffee associations independent of the Federation. 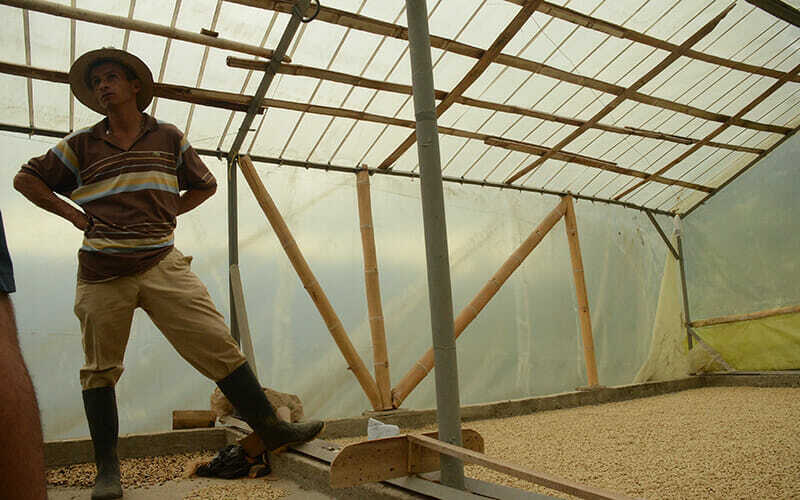 John Jairo Perez takes a break from drying coffee beans. 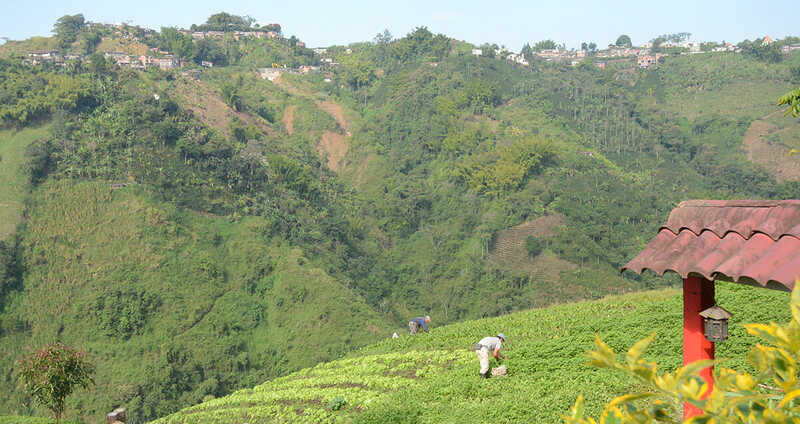 Castellanos’ vision is to see coffee growers behaving more like vineyards. “Vineyards would rather make the wine than sell the grapes at a much lower price.” Castellanos says. The same economics play out on his coffee plantation. He can get $1 to $1.50 per pound for selling green, unroasted beans. Once he’s roasted them, however, he can sell his beans for upwards of $6 per pound. To cater to picky consumers looking for freshness and authenticity, he’s started printing “picked on” and “roasted on” dates on his coffee bags. But the challenges facing Colombia’s coffee growers aren’t just about price. Production has been falling since 2008 when rainy conditions set in, exacerbated by climate change. The humid environment helped the spread of a fungal disease called leaf rust currently laying waste to coffee plantations across Latin America. 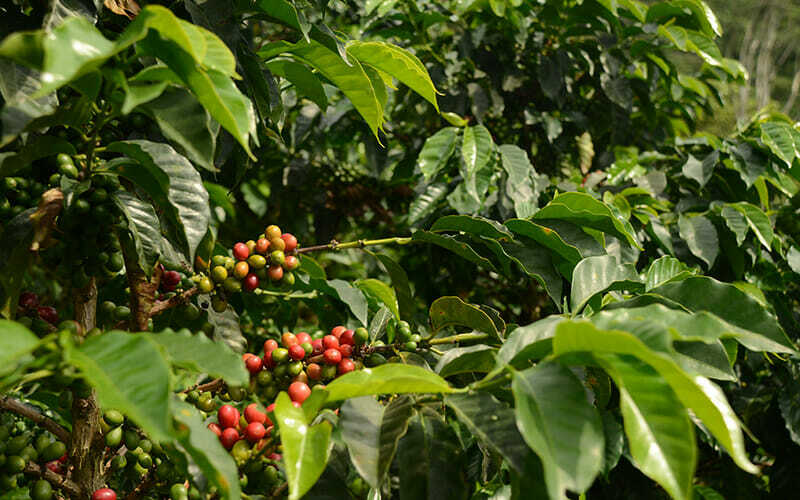 While Guatemala, Panama and Costa Rica are reporting more than 60 percent of production affected, Colombia was able to plan ahead, breeding a hybrid bean that was able to ward off rust for 30 years. Even with prior planning and new hybrids, by 2010 leaf rust was affecting 40 percent of Colombia’s coffee farms. Gaitan and his colleagues released a second generation rust-resistant strain called Castillo in 2005 that has been slow to catch on – farmers would rather rely on fungicides to ward off the leaf rust. “Coffee growers are very traditional,” says Gaitan. “When you get into coffee growing, it’s like a marriage. It’s a twenty-year-long commitment and you can’t be changing plants every two years. In fact, it takes two years for coffee plants to even start being productive.” It’s slow progress, but over the last four years, Cenicafe has helped 55 percent of plantations change over to rust-resistant plants. “Quality coffee is a combination of genetics, environment and human processing,” says Samper, back at the Federation. Coffee drinkers, he says, should be aware of the whole process: from its collection to the way it’s washed, dried, selected, shipped and roasted. “People need to know the story. You want a coffee with a first and a last name.” Samper hopes, of course, that the name is still Juan Valdez.